Poem numbered is from the enumeration found in the definitive edition of The Complete Poems of Emily Jane Bronte , edited by C. W. Hatfield. New York: Columbia University Press, 1941. The Jury is Out: Am I a Professional Writer? Camping Is Not Fun. Here is What You Can Do. Did you publish it on your blog? Where can i read yours? Thank you for visiting! I enjoy your blog posts Lucile! I like this–I can picture myself in her shoes experiencing the sounds of the waves! It’s by the way one of the places where the Americans arrived on D day. This place brings one to many reflections. Lovely, and who better than Emily Bronte to put solitude into words? Thank you. Thank you! Indeed, that is her! Thanks fir visiting. Thanks. Iphone pic though; edited with iphoto. Simple photography. Are you ready to learn something? This was from an iphone….4! I have a 5 now and keep making good ones. This week I bought an external 4-1 lenses for iphone and can make macro, eye fish and wide angle photos. But don’t think sn iphone can deliver what your camera does. Impossible. It is a good solution for on the go photos, for people like me, who see stories in every scene and stop to capture it. I bike a lot and it would be too much to carry a DSLR. At maximum I bring a good quality compact one. I still have a nikon fm, before digital existed, and i keep it just for the love between us. I’m considering to buy a DSLR though; which one do you have? It’s impressive what these little things do but I tell you again. What you can do with yours, is much more! You have made stunning photos. I saw yours on Instagram and they are not less than great. Take a look at the new ebook on photography from WordPress, it might save you reading manuals. I downloaded it and will see the tricks they teach us. My husband and I are currently researching cameras, as we both love photography; an iPhone is too limited. He dropped our compact Canon… I may use again my old Nikon FM and develop some photos myself. For now…more iphoneography! Thanks! Thank you, Andy! I confess that the poem surpasses the pic in beauty. Love the clarity in that photo! Even the pebbles! And on an iPhone is even more amazing. I struggle to get clarity like this on mine. I’m about to buy those external lenses though. Do you like them? Thank you! I used an iphone 4 when making this photo and didn’t use external lenses; they’re available for iphone 5 and 5s. I like it a lot, it is surprisingly good. I haven’t used much as I bought it recently. Btw, the iphone 6 has the sane camera as the 5s. That’s a lovely shot Lucille. Great composition. Belo poema para uma composição fotográfica idem. Pena não ter achado nenhuma tradução na língua de Camões para compartilhar. Obrigada. De fato, o pema é muito bonito. Quando terminar de atualizar o site em português, sera mais fácil compartilhar. Tenha uma boa semana. LUCILE, pode apagar o último comment. Pensei que você estava comentando no meu blog… Sorry! Nice picture. I enjoy these scenarios; sitting on a beach close to the shore, watching out to sea spying ships in the distance and wondering where they are heading from/to. The sound of the water on the stones and seagulls squawking overhead. grey skies threatening rain, the wind whips around you and you pull your coat closer. A wonderful day on the shore. Beautiful! Thanks for posting your thoughts here! I like your photo. 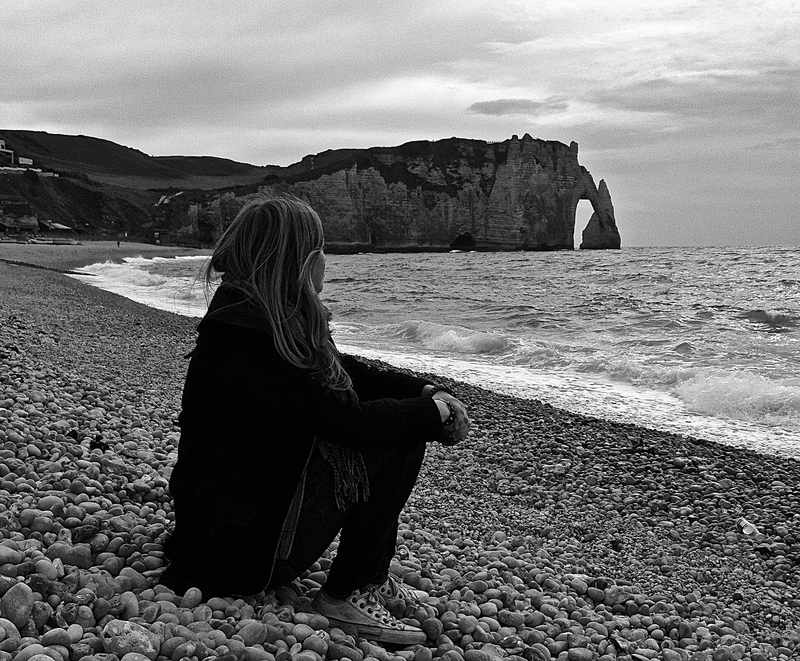 The woman looking to the sea fits perfectly to the monochrome style. Well done!